I have very mixed feelings about Justice League of America 24. 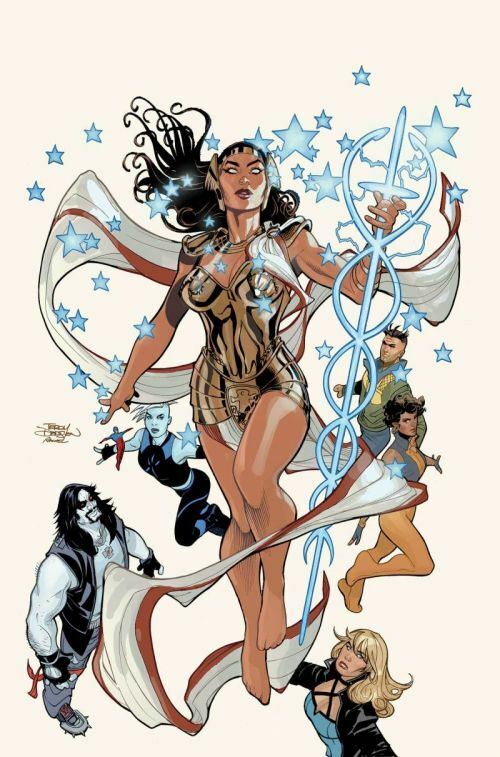 I was very excited when Promethea showed up at the end of the previous issue. Her book was a fascinating exploration of creativity and the different notions of “higher realms.” The Queen of Fables has appeared in tales that resolve with exceptionally clever ways of defeating an entity that draws its power from stories. Put the two together, and an absolutely brilliant and insightful tale seemed in the offing. But that’s not what we get here. Promethea does have a good scene, but it comes late in the issue. Her first bit is a straight out superhero fight against the Queen of Fables, a scene that seemed to do a disservice to both of the characters. Now that is not to say there is nothing of merit in this issue. Both Vixen and Killer Frost are used very well, and overall this is an above average Justice League tale. It’s just not a great use of Promethea. Orlando seems a bit more interested in the interpersonal relationships of the heroes. I don’t mind that, and he has mastered doing a lot with a little. The Ray, for example, has a small role in this issue, but the brief bit that centres on him does a lot in paying off his plot thread running through the last few issues. I did enjoy this issue, I just expected more from it.